Sarah Donnelly is a Marketing Specialist and Graphic Designer at Social Assurance. After graduating from college in December of 2017, Sarah accepted a full time position with the company and made the decision to move to Kansas City. In the first half of this episode, I spoke with Sarah about the transition from college to working full time for a startup and how she stays healthy under pressure by focusing on her faith, dance and spending time with others. During the second half of this episode, Sarah and I discussed the events of August 14th, 2017. At the time, Sarah was interning for Social Assurance and was housesitting/dog sitting for us while we were in Europe. Just moments after Sarah had returned from taking her cousins out for ice cream to celebrate the first day of school, our neighbor’s home exploded. The explosion caused damage to 43 homes in our neighborhood and later killed my neighbors who were both inside at the time of the explosion. Sarah’s thoughtfulness, care and perception of life’s events is wise beyond her years. I spoke with Sarah about how life’s transitions affect us, whether expected or not, how we process them and how we move forward. You can connect with Sarah on Twitter or Instagram. Christina Oldfather is the Director of Innovation and Entrepreneurship for the Lincoln Partnership for Economic Development (LPED) based in Lincoln, Nebraska. She plays an active role in the local startup community by recruiting and mentoring teams for the NMotion accelerator program. In this episode, I spoke with Christina about the local startup community and how she stays healthy under pressure as a busy professional, active mother and part-time Jazzercise instructor. You can connect with Christina on Twitter, Instagram or Linkedin. You can also learn more about the Nmotion accelerator on their website or check them out on Facebook. Please be sure to subscribe to the podcast, follow Healthy Under Pressure on Instagram and like us on Facebook. Registered dietitian and nutrition communications consultant, Neva Cochran, partners with food, nutrition and agricultural organizations to promote positive, accurate, scientific-based nutrition messages. By encouraging people to “eat beyond the headlines,“ she champions enjoyment of eating, not fear of food. During the episode, Neva and I discuss her career journey and how she stays healthy under pressure by giving back to the next generation of Dietitians. You can follow Neva on Twitter, Instagram or connect with her on Facebook. Laurie Baedke is a speaker, author, and consultant with broad experience building companies, and leading organizational change. Laurie has specific expertise in entrepreneurship, organizational culture, emotional intelligence, and strengths based leadership. Laurie holds a faculty appointment at Creighton University’s Heider College of Business, where she serves as director of the Executive MBA in Healthcare Management program. During this episode, Laurie and I talk about she stays healthy under pressure by curating her circle of people and why she believes it’s important to be comfortable being uncomfortable. You can connect with Laurie on Twitter or Linkedin. And be sure to check out her website for more information on her upcoming podcast! Corey Spitzer is the Co-founder and Chief Architect of ScoreVision, a software company based in Omaha, Nebraska. Having worked in tech for nearly two decades, he knows all too well the stresses and unhealthy habits of fast-paced, high pressure environments. In this episode, I spoke with Corey about how he stays healthy under pressure as a busy parent, software developer and business owner. To get in touch with Corey, you can follow him on Twitter or connect with him on Linkedin. 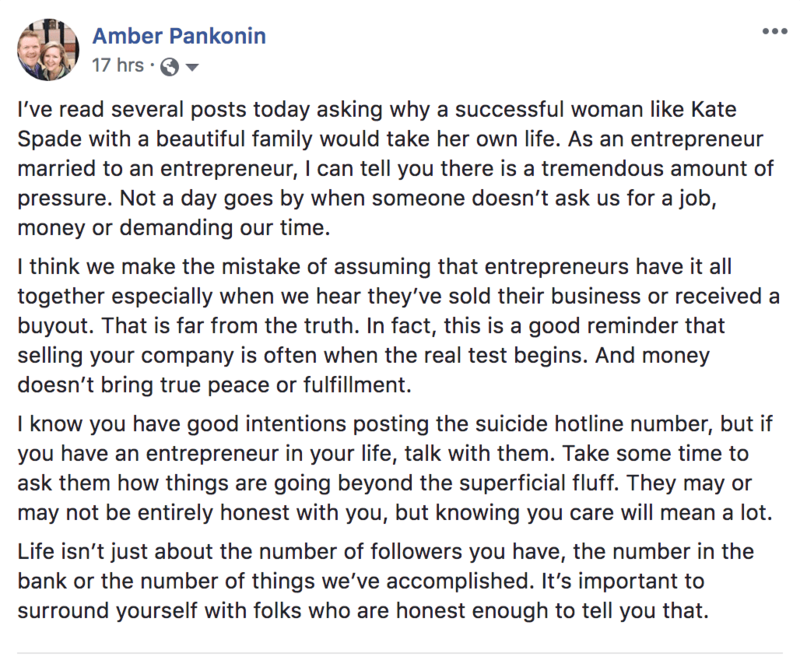 After hearing the news about Kate Spake and reading the reactions on social media, I was inspired to write my own thoughts about her unexpected death. The response I received from this post was generally positive, but there was one comment that I would like to address. So incredibly stressful to have your own businesses but I think we need to do that with people in general, not just entrepreneurs.” -Facebook Friend. When I wrote this, I was not saying that we shouldn’t do this for all people. Of course I believe all lives matter and that we should care for all people…not just entrepreneurs. However, I will not apologize about directing this particular post towards entrepreneurs. I took this moment to speak to entrepreneurs and the people who love them. Kate Spade was an entrepreneur married to an entrepreneur. She was dealing with pressures that most of us, including myself, will never understand.